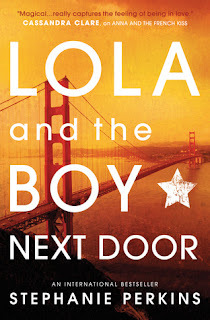 Seventeen-year-old Lola lives in San Francisco with her two dads, is really into costume design, and has an older boyfriend named Max who is in a band. One day she returns home to find a moving truck next door and to her great distress learns that the family moving in is one she knows. They are the Bells and not only have they lived there before, but one of them broke Lola's heart just before they moved away. Now Lola's life is upended. She wants to hate Cricket Bell for how he treated her, but she is still so attracted to him, no matter how much she tries to deny it. Of course, she's madly in love with her boyfriend Max and tries to just be friends with Cricket. As you can imagine, that goes really well. To complicate matters further, Lola's biological mother also shows up and wreaks havoc with her comfortable life. Stephanie Perkins really has some chutzpah naming her male romantic lead Cricket, doesn't she? To be fair, his twin sister's name is Calliope, though she is a figure skater and that somehow seems appropriate. Anyhow, Cricket is adorable and kind and has been in love with Lola forever, and you know they are going to end up together (see: title of book) but the fun is in getting there. I loved Lola so much! Sure, she made mistakes and didn't handle difficult situations well, stringing Cricket along while hanging on to her boyfriend. But her relationship with Max was her first real romance so it was complicated for her. Also, Max was older and nobody was as excited about their relationship as she was, and I think it made her even more determined to keep him. I loved her confidence though, and her sense of fashion that would embarrass many people but was one of the most wonderful things about her. Her goal was to never wear the same outfit twice, and she dressed in rather outlandish ways that were super creative and probably took a lot of energy. Through most of the book she was preparing for an upcoming school dance; she planned to dress up as Marie Antoinette and was making her outfit herself. It was kind of wild. This book is the second in a series, after Anna and the French Kiss. Anna and Etienne from that book are friends with Lola and although they're only secondary characters, it was great to see them again. Or to hear them, I guess, since I listened to the audiobook. The narrator was different from the first one, but sounded pretty similar I think. I really enjoyed listening to it and I will soon be downloading the third book in the series. This is a great teen romance for the summer!